"MISOGYNIES is a superb and vivid piece of writing, eminently readable, wonderfully fresh." 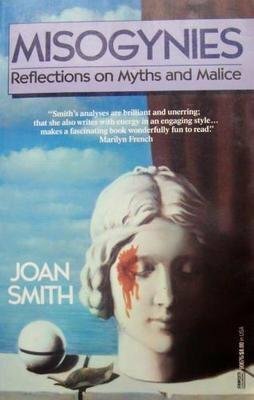 In this collection of stinging essays Joan Smith explores the phenomenon of women-hating in politics, religion, history, literature, and popular culture on both sides of the Atlantic. A fascinating collection from the mind of a scholar, educator, and observer of our society, MISOGYNIES will make readers of both genders wonder more about the excuses for hatred of women we create as a society, why we accept them, and what it means to all of our lives. This collection of essays examines women-hating in politics, religion, literature, history, and popular culture. Using references to current events, best-selling novels, popular films, and historical texts, Smith explores the society that coerces men and women into stereotyped roles, separating them and creating a male-dominated power structure. Despite an apparent deadlock in the war between the sexes, Smith sees hope for the future. Unlike militant feminists such as Andrea Dworkin ( Letters from the War Zone, LJ 9/15/89), she feels that gender-specific behavior enforces unnatural separation of men and women. She wants to open a dialog that will result in healthy relationships between the sexes. By working together, they can create a new, egalitarian society. While much of her critique and exhortations for change have been heard before, her positive approach is refreshing. Recommended for most collections. -Barbara M. Bibel, Oakland P.L., Cal.